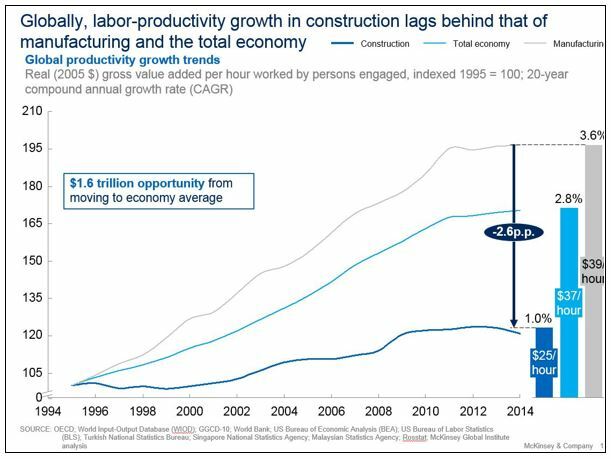 The Unassuming Economist | Construction Sector: The World’s Next Productivity Story? In this issue of the Global Housing Watch newsletter, Jan Mischke talks about productivity in the construction sector. Jan is a senior fellow at the McKinsey Global Institute (MGI), McKinsey’s business and economics research arm, based in Zurich. Hites Ahir: Reinventing Construction: A Route to Higher Productivity is a new report that you co-authored with colleagues at the McKinsey Global Institute. The report finds that productivity in the construction sector has been poor, and argues for a need to increase productivity in the sector. Why this matters? What is at stake? Jan Mischke: At close to $10 trillion US dollars a year, construction related spending is huge, and there are large unmet needs: 330 million urban households lack access to decent housing, and we estimate there is a 0.3 percent global GDP gap in infrastructure investment. You would usually expect a productivity response under such circumstances, but it hasn’t happened. Closing the gap in labor productivity in construction to economy average would create $1.6 trillion US dollars in value to be shared among contractors, owners, and workers; equivalent to half of the world’s annual infrastructure needs. Hites Ahir: What explains the poor performance? Jan Mischke: We identify 10 root causes at the firm, industry, and external environment level. These include stringent regulation, cyclicality and dependence on public-sector demand, informality and sometimes corruption distorting the market, industry fragmentation, mismatches in risk allocations and rewards in contracts, and an opaque market place that is hard to navigate. This results in subpar project management and execution, insufficient skill building, inadequate design processes, and underinvestment in digitization, R&D, and innovation. Contracting and design and planning processes stand out as the most fundamental issues. Too often, there is too weak a link between profitability and productivity; badly designed and ill-planned projects with long overruns can be quite lucrative. 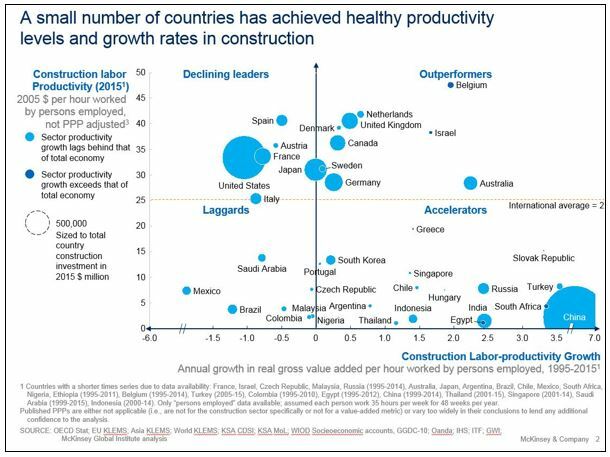 Hites Ahir: How does productivity in the construction sector compare to other sectors? Jan Mischke: While other sectors from agriculture to manufacturing have transformed their labor-productivity performance, change in the construction industry overall has been glacial. Consider that in the United States between 1947 and 2010, manufacturing achieved cumulative real growth in its productivity of 760 percent. Construction managed only 6 percent. Hites Ahir: How does it compare across country groups—advanced and emerging economies? Jan Mischke: There are substantial gaps between advanced and emerging economies, although comparisons are difficult as purchasing power parity indices in the sector seem unreliable. More revealing is a comparison of growth rates in productivity over the long term (we look at two decades). Among emerging economies, some like China or Turkey managed to achieve rapid growth, applying high levels of standardization and mechanization, while others like Brazil or Saudi Arabia fell further behind. Among advanced economies, the US construction sector performed best as measured by labor productivity during the build-up of the highway network but then fell back. Other countries including Australia with its large mining projects, Belgium with its waterworks and high wage cost, and the UK with its many sector-level initiatives have managed to move forward. Hites Ahir: How do you measure productivity in the construction sector? Jan Mischke: We look at labor productivity, defined as value added per hour worked in the construction sector, and adjusted for inflation over time. This differs from operational productivity metrics like cubic meters of concrete poured that are often used in the sector in that it takes into account the value eventually created for the customer. Data is largely based on national accounts. There are many deficiencies to that data, most notably the difficulty of measuring prices consistently and comprehensively over time, as structures tend to be somewhat unique and difficult to compare with one another. Interviews and operational metrics, however, seem to confirm the broad picture. Hites Ahir: So how could the construction sector be cheaper, faster, and produce more? Jan Mischke: Seven areas of improvement have been reasonably well known in one form or the other for some time, but not consistently been adopted: reshaping regulation; rewiring the contractual framework to change industry dynamics; rethinking design and engineering processes; improving procurement and supply-chain management; improving on-site execution; adopting digital technology, new materials, and advanced automation; and reskilling the workforce. Parts of the industry could move toward a manufacturing-inspired mass-production system that would boost productivity up to tenfold. Hites Ahir: If action is taken in the seven areas that you propose, by how much will productivity increase, and will this be enough to meet the challenges that you lay out in question one? Jan Mischke: Examples of innovative firms and regions suggest that acting on all seven areas simultaneously could boost productivity by 50 to 60 percent. This would be sufficient to bridge the productivity gap to average economy level. Hites Ahir: The report points out that there is a lack of commitment to invest in technology, and many firms don’t recognize the fact that underinvestment is a key factor behind the sector’s poor productivity. What explains this, and how could this be changed? 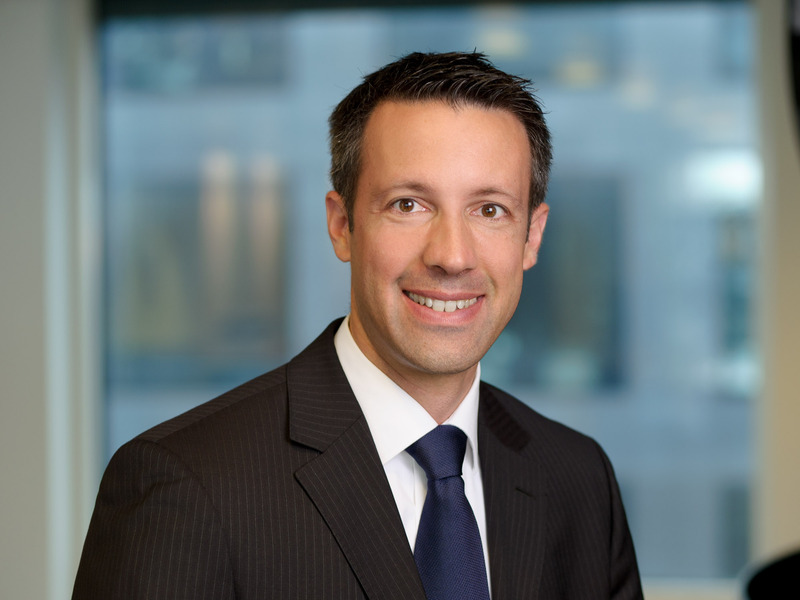 Jan Mischke: The sector generally is relatively asset-light; with relatively thin margins and, in many countries, relatively cheap labor, contractors tend to shy away from making larger investments. For digital technologies specifically, there are large learning curves ahead: for decision makers to understand the business case, for organizations and their staff to learn to use the technologies appropriately, and for supply chains to coordinate. There is also a challenge to derive more value from digital tools due to task duplication during the transition. Today, frequently, there is no consistent “digital-twin” of a structure. Digital models are being printed for use with suppliers, who make changes and optimizations without feeding them back to the models, and there are substantial differences between as-built and plans that make optimizations in supply chains, work processes, and lifecycle management difficult to capture. Hites Ahir: The report also point out that parts of the industry could move toward a production system, but this approach has been limited thus far. Why is this the case? Jan Mischke: Setting up a production system requires substantial investment in the plants as well as design and engineering, supply chain build-up, etc. These investments are only worth-while with scale – thousands of units or more per year within a 2-3 hour logistics radius around the plant. In most regions and market segments, there is no clarity or certainty on this volume of demand for fairly standardized offerings. Few owners have the scale to create it, and smaller owners lack incentives and coordination to standardize. Also, current offerings often operate with traditional materials and technologies, distant logistics, and limited volumes and thus achieve a cost benefit that is not radical enough to reshape demand from the supply side. Increasing sustainability requirements that are relatively easy to meet in a factory setting but more difficult on site, as well as increasing requirements on speed in addition to cost, among other things, may change this picture. Hites Ahir: Could you give examples of governments and companies that have successfully boosted productivity in the construction sector? Jan Mischke: By far, the fastest productivity growth in the sector occurred in China, at close to 7 percent a year over two decades. The country successfully manages to leverage its scale – about a third of the global construction market is in China. One example is its 10,000 km high-speed rail network. All viaducts were standardized to spans of 24 or 32 meters, beams are fabricated in factories and then launched over the viaduct with specialized 18 axle vehicles. Cost of high-speed rail construction is a fifth of what it is in the UK. Hites Ahir: What is the state of construction productivity when it comes to housing? Jan Mischke: Housing construction is particularly challenged. Home builders tend to have roughly sector-average productivity levels, above specialized trades but below civil and industrial works. Yet there are a lot of specialized trades sub-contractors with low productivity home building, and even more so when it comes to refurbishment, which in Western Europe represents 60 percent of the total residential construction volume. 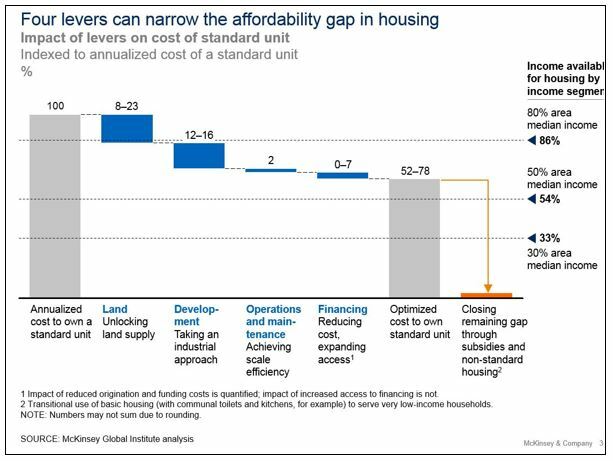 Hites Ahir: A blueprint for addressing the global affordable housing challenge—is another report that you co-authored with colleagues at the McKinsey Global Institute. In a nutshell, what does this report find? Jan Mischke: Our research finds that every third urban household globally cannot afford decent housing at market rates. The total gap between what they can afford and what they would need amounts to 650 billion US dollars a year. The number of households affected will grow from 330 million to 440 million by 2025. Four levers can reduce cost by 20 to 50 percent and narrow the gap: unlocking land at the right location, reducing construction cost, increasing operations and maintenance efficiency, and reducing financing cost. Hites Ahir: How can an increase in productivity in the construction sector help to narrow the housing affordability gap? Jan Mischke: 1.6 trillion US dollars in value is at stake. Not all of that will accrue to home owners and residents– much of it will go to salary increases for workers or be retained by contractors as additional profits. But if only one-third of the value translated into cost savings, that would theoretically be enough to bridge the gap. In particular, industrial approaches seem promising, as they cannot only considerably take cost down, but also increase speed of delivery; at the rates of urban growth in many emerging economies, speed will be of the essence. And mass affordable housing lends itself particularly well to the types of standardization required, as long as sufficient care is taken to build diverse and sustainable communities rather than repeating mistakes of the past leading to ghettoization. Hites Ahir: A tool kit to close California’s housing gap: 3.5 million homes by 2025—is also another report that you co-authored with colleagues at the McKinsey Global Institute. How does the report on construction productivity tie with this report? Jan Mischke: California is, in many regards, one of the most advanced, prosperous, and envied places on this planet. Yet 40 percent of its residents cannot afford decent homes at market rates. The primary thrust is to bring more well-located land to the market, and enable densification particularly around transit hubs. But raising productivity in construction to take costs down plays a substantial role, too. And indeed, quite a few of the more innovative players in modular and industrial construction that we spoke to have or plan to have activities in California. Hites Ahir: Could you give an example of a country and company that does well on housing construction? Jan Mischke: Singapore is an interesting case. The bulk of housing production takes the form of public housing built on public-owned land. This allows dense, transit-oriented development to keep cost manageable despite obvious scarcity of land in the metropolitan state, as well as standardized construction at city scale. There is increasing use of prefabricated volumetric construction or lightweight materials like cross-laminated timber. And the government actively promotes productivity via a number of means like promoting the adoption of Building Information Modeling (BIM). Labor productivity levels are still not world-class, however, not least due to relatively cheap and low-skilled migrant labor. Hites Ahir: Are you seeing any signs of disruptive entrants shaking the construction industry on the housing side? Jan Mischke: Since the publication of our report, we had discussions with more than a hundred players in the construction eco-system. An astonishingly high share recognizes the challenge, opportunity, and need to change, and many are developing or testing new strategies, business models, and approaches. It is too early to judge what strategies will win in the end in which market and segment, but the more interesting ones include players building up fully-digital units with integrated manufacturing facilities to produce mass-customized kitchens or bathrooms, players betting on standardization and developing and producing units at city scale, players integrating along the value chain from design and engineering all the way to asset ownership and operations to capture the opportunity of massively reduced lifecycle cost, or players experimenting with ever larger scale of 3D printing.